Canon PowerShot ELPH 160 and Canon PowerShot ELPH 170 are great choices if you are looking for a decent and reliable digital camera that you can count on for capturing the family fun and special memories without a hassle. However, you may get confused choosing between the two products because they indeed look similar and share some similarities. Even so, still, Canon PowerShot ELPH 170 is being priced slightly higher than Canon PowerShot ELPH 160. 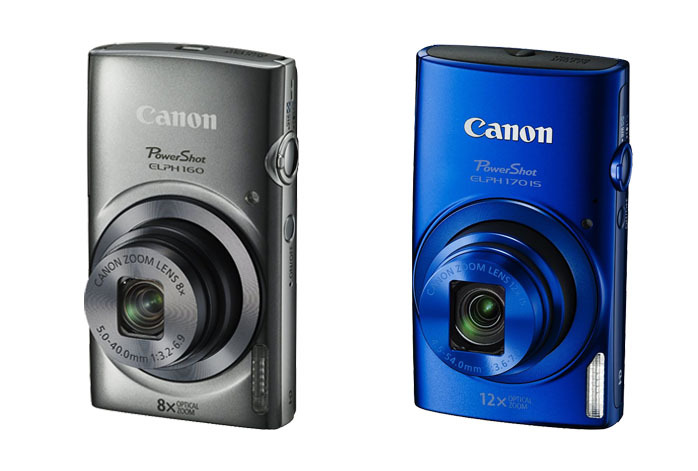 So, what are the differences between Canon PowerShot ELPH 160 and Canon PowerShot ELPH 170? Let’s find out in the comparisons below! Both Canon PowerShot ELPH 160 and Canon PowerShot ELPH 170 are compact and portable digital cameras. ELPH 160 is a little bit smaller and lighter than ELPH 170, but the differences are not significant and can be neglected. They each features a 2.7” high-res display screen. Unfortunately, though, the display screen is the fixed type. It can’t be tilted or rotated. Still, it does a good job in reproducing crisp and solid images, allowing for confident and precise framing. Both models indeed look cool and fancy, but neither is weatherproof. So, you will need an additional housing if you plan to use the camera in a wet environment. Each of them comes with a built-in flash, which can be handy whenever you meet a difficult low-light situation. Quite interestingly, each of Canon PowerShot ELPH 160 and Canon PowerShot ELPH 170 is armed with the 20MP 1/2.3” CCD image sensor to deliver sharp and crisp images with full and solid colors. Thanks to the CCD technology in use, the output results have very low noise levels. They both have the ISO range of 100 – 1600. However, Canon PowerShot ELPH 160 only has digital image stabilization. Canon PowerShot ELPH 170 is packed with optical image stabilization, offering an improved image clarity even if the camera shakes or the photo object moves. In addition, Canon PowerShot ELPH 170 also comes with a more powerful lens than Canon PowerShot ELPH 160. Canon PowerShot ELPH 160 only has a 28-224mm F/3.2-6.9 lens with a maximum zoom of 8X. Meanwhile, Canon PowerShot ELPH 170 boasts a 25-300mm F/3.6-7.0 lens which has a maximum zoom of 12X. In general, Canon PowerShot ELPH 170 indeed makes the best way to go. The optical image stabilization is more superior, and the higher zoom levels can be practical for long-range shooting.